Some people avoid overnight, or “redeye” flights the way Fox News avoids accuracy. Not me. Traveling home from the west coast I don’t want to blow a day in the air when I can get the ordeal over with in the middle of the night and then have an viable excuse for avoiding household chores the next day as I plead sleep deprivation, even though I generally sleep quite well on the plane…but no one needs to know that. Sssh. The redeye does have its own personality and mores and to endure it successfully, it’s important to be aware of both. I hope to provide this service with the following paragraphs. 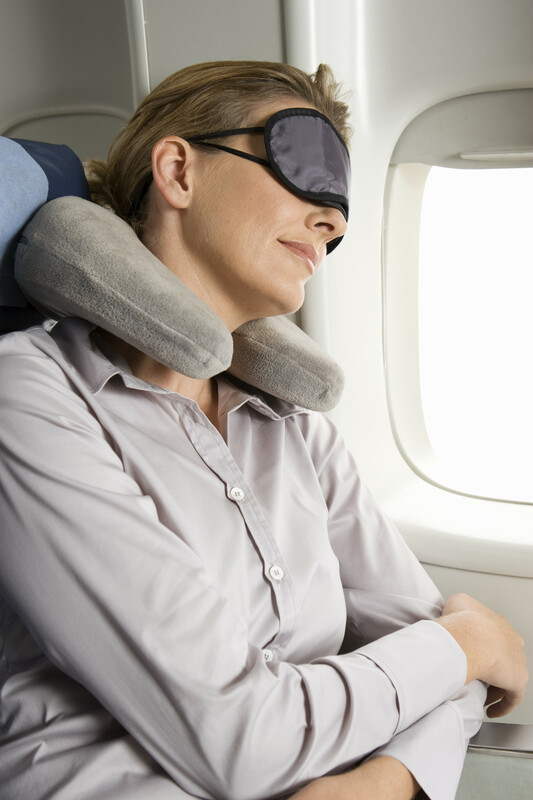 Let’s start with the two distinct camps of redeye passengers: Readers and Sleepers. Sleepers are easy to spot even before they take their seats. That’s because from the time they take a seat in the gate area they have already affixed a yoke-shaped pillow to their necks giving them the appearance of a bi-ped Babe the Blue Ox. They’ll wear the pillow to the bar, to the newsstand, to the Starbucks, to the rest room as if suddenly, they will need to snap into a quick slumber while awaiting the foaming of their cappuccino’s milk or drying their hands in the hot air blower. Once the Sleeper is on board, it’s all business. They reach up to make sure the overhead light is off, the vents are closed, they’re wrapped like Tut in a threadbare, bacteria-infested airline blanket and tip their seat back to the point where the passenger directly behind them is forced to stash their knees in the overhead bin. The ultimate confrontation between the Sleeper and Reader is the most delicious. It’s when the Sleeper is in the aisle seat and the Reader is not. At the precise moment when the Sleeper reaches deep REM sleep, the Reader is called by nature. In my experience it often goes like this. Sleeper grunts and turns, now clearly enjoying the Reader’s discomfort. Reader, now desperate, attempts to slip out by stepping over Reader’s splayed out legs. Sleeper beats Reader to the punch. Unbuckles seat belt and quickly makes a beeline to the last vacant toilet ahead of Reader. So that’s how it works. My best advice if you’re stuck on a redeye is to bring both a pillow and book and choose your sides carefully.